Manoeuvrability, dimensions and possibility to work in hard-to-reach areas are the advantages of small Strassmayr sprinklers. 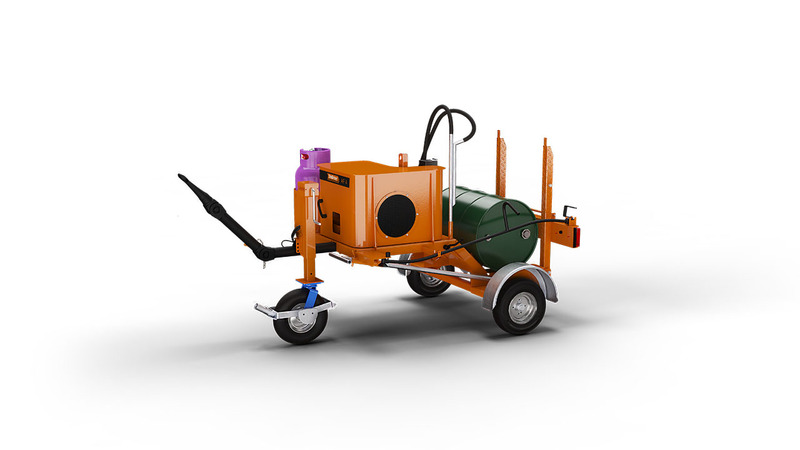 Straßmayr AF 4 sprinkler is intended for spraying works of small areas without the need for transport and heating of large emulsion tanks. AF 4 operator has the lance made of light steel alloys with 5 m long hose. The lance is finished with a cone nozzle allowing for accurate and quick spraying of even large surfaces. The safe, cheap gas emulsion heating system equipped with a thermometer is responsible for keeping the right temperature of emulsion. The emulsion tank is a standard barrel with a capacity of 200 l.
The machine has a drive of all features in a form of an internal diesel combustion engine driving the emulsion pump, heated from the engine exhaust system. Simple, comfortable and uncomplicated construction of the machine. Easy access to all components of the device. Small size for quick and cheap transport to a construction site. No need to heat large amounts of material for small-surface sprays.